Voltas 183V EY is a 1.5 ton inverter type split AC. It’s ISEER rank is 3 star. It’s a executive series model. It’s a cooling only model. It has sleek but plain looking white color indoor unit with temperature display on it. 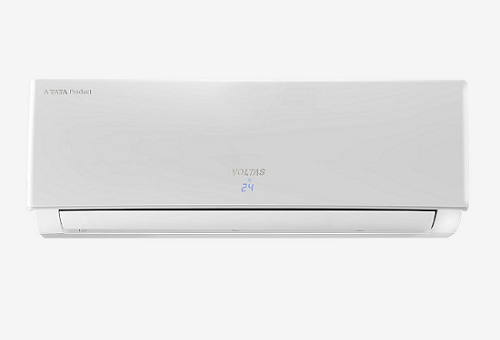 The main feature of this Voltas 183V EY is that its compressor runs on inverter technology. A inverter technology compressor runs on variable speeds. Such compressor never shuts down like traditional ac’s compressor. Rather they run on flexible speeds or we can say they varies their speed according to load conditions or cooling need conditions. If the ambient temperature is less and thus load requirement is less such machines lower their speeds and can save lot of electricity. Apart from saving electricity they also maintain a uniform temperature compare to a traditional machine. Therefore cooling provided by them is more comfortable and smooth compared to a traditional machine. Apart from that it has all the standard features like a anti dust and anti fungal filter, auto restart, dehumidification, anti corrosive blue fins and self diagnosis. Comes standard with LCD remote. Although there is no dual temperature display. The full load capacity (100%) of machine is 5250 Watt. Half load capacity is 2550 watt. Maximum cooling capacity is not provided. Full load power is 1755 watt. Half load power is 655 watt. ISEER (Indian Seasonal Energy Efficiency Ratio) which is a practical and realistic way of calculating EER ( Energy Efficiency Ratio) by taking seasonal variation of temperature into account is now standard for calculating efficiency of inverter air conditioners and providing star rating to inverter air conditioners. ISEER of this machine is 3.7 which make it 3 star inverter ac according to current BEE inverter star rating plan. But actually it’s better than or equal to a 5 star fixed speed or traditional air conditioner. Indoor unit volume level at maximum speed is 44db which is standard within this capacity models . Maximum ambient operating temperature range is 52 degree Celsius. Refrigerant used is R410a which is better than R22 and is in tune with demand of time. If you want to use the latest inverter technology along with latest R410a refrigerant in your air conditioner along with Voltas brand reliability without breaking a bank you can go for this model. A recommended product.